Nice double-meaning title, e.g. 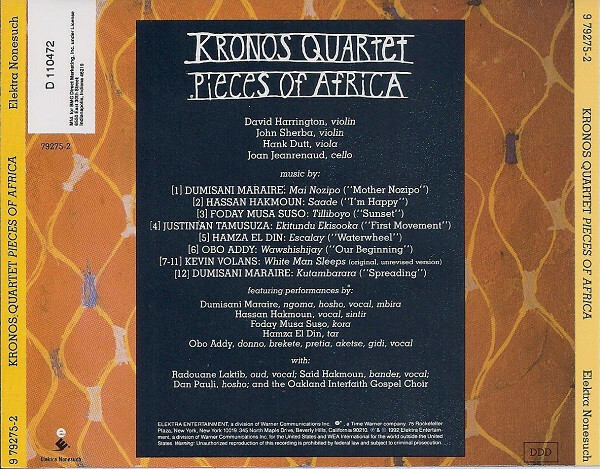 “compositions” out of Africa, each being a (sonic) piece of the continent. The Kronos Quartet more or less single-handedly (or, should I say, “four-handedly”) initiated, in the 1980s, the trend that I would dub “Classical encounters World Music”, with their recordings of arrangements of Jazz Classics (their tribute to Thelonius Monk was one of their first recordings, back in 1985, on Landmark LCD 1505-2) or progressive Jazz (Zorn and Lurie in Kronos Quartet : Winter Was Hard), Pop (Hendrix’ Purple Haze in 1986 on Kronos Quartet: Sculthorpe, Sallinen, Glass, Nuncarrow, Hendrix) or popular dance music (Piazzolla: Five Tango Sensations). Then came the fruitful encounter with Terry Riley and the transformation of those ethnic roots (in the case of Riley, the North Indian Ragas of Pandit Pran Nath) into fully-fledged contemporary string quartets that brought a new slant and a gush fresh air to a time-hallowed genre: Cadenza on the Night Plain (Gramavision, 1985-1988) and Salome Dances For Peace, Elektra Nonesuch (1989). 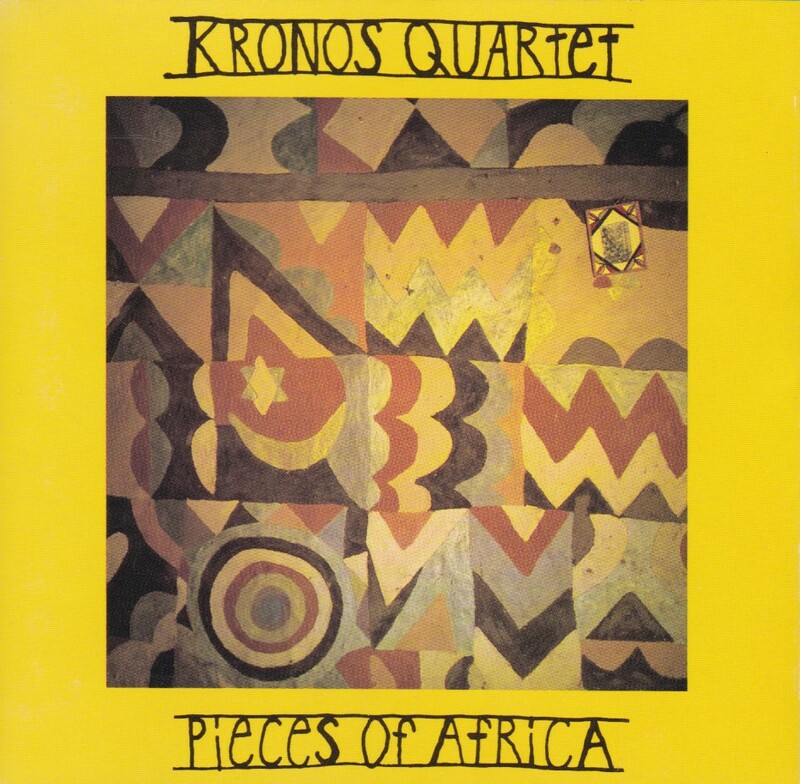 After Riley came Kevin Volans, who wrote his first three String Quartets for Kronos: “White Man Sleeps” in 1985 (Kronos recorded two movements out of the five in 1987 on White Man Sleeps, but the complete quartet is played here), “Hunting: Gathering” in 1987 and “Songlines” in 1988. The Quartets are rooted in World music, taking their inspiration in many musical traditions of Africa, and in repetitive minimalism, but like Riley, Volans shows a sonic imagination and formal freedom that makes them entirely original works. 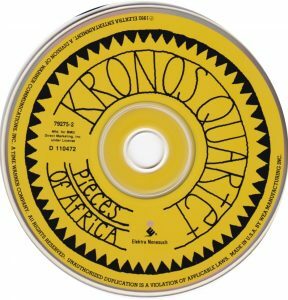 Here, Kronos pursues the gig by commissioning African musicians, of which only a few seem to have some kind of formal training in Western classical music. The selection of composers gives a nice cross-section of the continent: they come from Zimbabwe, Morocco, Gambia, Uganda, Sudan, Ghana and, in the case of Volans, South Africa. Not the rest of these compositions: the music remains folk or traditional in string quartet attire, with a complement of various African instruments (explanations would have been welcome: not everybody needs to know what is a ngoma, a hosho, an oud, a bander, a kora, a tar, a donno, a brekete, a pretia, an aketse, a gidi, a mbira) and, in some pieces, vocals. In track 12, I’m not sure whether I hear a percussion instrument (and none is credited for that track in the booklet), or just the performers striking the wooden boards of their instruments. And even the string quartet doesn’t seem to change much to the color of the original music: all these cultures have string instruments. 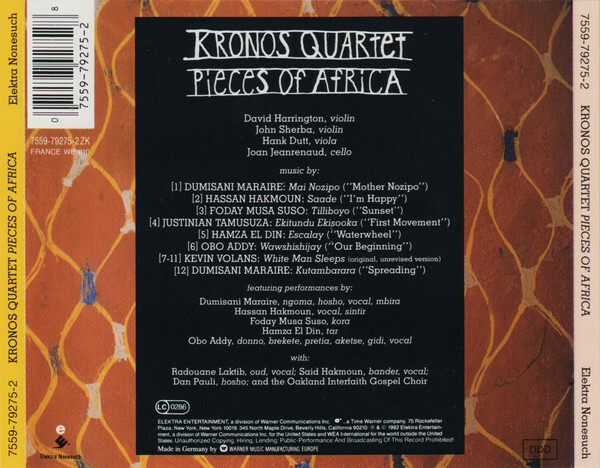 The music is pretty and sweet, undemanding and inconsequential, mostly rhythmic and dance-like or sounding celebratory (track 1, by Zimbabwe composer Dumisani Maraire, music that you could imagine taking place in an Irish pub as much as in Southern Africa, track 2, 4, 6), more rarely sounding more contemplative and ballad-like (3). 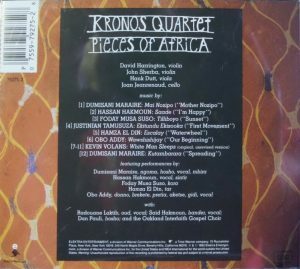 Those closest to the Western traditions seem to be Justinian Tamusuza (4) and Hamza El Din (5) – I’m not surprised that they were respectively a student of Volans and introduced to the Kronos Quartet by Riley. In that context, the composition of Kevin Volans stands out. I’m not sure what to make of the indication on the booklet that this is “the original, unrevised version“. As is clearly explained by Volans himself in the liner notes of the two competing recordings by the Duke Quartet (on Black Box BBM1069) and the Smith Quartet (on Cala-United CACD88034), the piece was originally written with non-equal-temperament tuning in mind, for two harpsichords tuned in African tuning and evoking the African mbira (“the generic name of a popular African instrument with a set of plucked keys, a soundboard and resonator“, says Volans), viola da gamba (encouraged to bow “badly”) and percussion. 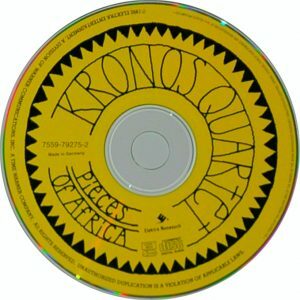 So what Volans wrote for the Kronos Quartet in 1985 (after initial resistance at the idea of transposing for an instrumentarium that “encapsulated the very heart of Western classical music” and played in conventional Western tuning) was indeed a transcription or reworking for string quartet. Maybe then Volans revised the string quartet after its premiere by the Kronos and they are playing the version of the premiere, although the differences with the two other recordings are difficult to detect, and when there are some (I think I’ve spotted one longer and one abridged patch of repetition, both short), it is hard to tell if they derive from options offered by the score, or from different prescriptions. Anyway, by Volans’ own admission, the transposition and retuning made the composition into an entirely new piece: “when Kronos asked me to do White Man Sleeps for them, I became interested in the issue of translatability. I have come to the conclusion that the color fo the instruments or the color of the sound that they produce, is as important for the meaning of the music as the pitch, or the rhythms, or anything else.” Having heard the original composition, cleverly featured on the Smith Quartet’s disc, I also think the reworking is much better. While the original version is often trudging and rattling, the version for string quartet is highly imaginative and evocative, sensuous in sound, exhilarating it its motoric/repetitive movements (1, 2 & 5), intriguing in the jazzy and slightly limping pizzicatti of its third movement, ceremonial and hushed in the fourth movement (verging on the sentimental but not quite crossing the line), and always melodically appealing. It lets you hear and enjoy, better than the original, what you can imagine are the sounds of Volans’ physical African environment; by his own admission, these have inspired the composition even more than the country’s culture. It is the substantial piece in an entertaining but not very substantial program, although Volans’ next two string quartets (also written for Kronos) are even more imaginative and free. 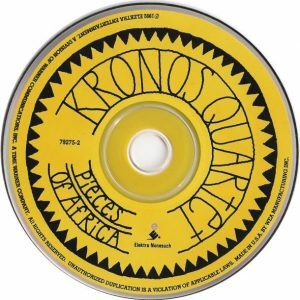 Kronos recorded only the second, on Elektra Nonesuch 9 79253-2 and left to the Balanescu Quartet to record the third, along with the second, on Argo 440 687-2. Here, in White Man Sleeps, though the sonics afford them less sensuous instrumental presence, the Kronos are more dynamic, biting and light-footed than their competitors, the Duke Quartet and the Smith Quartet (see links above), which makes theirs a preferable version, although the Duke’s all-Volans disc remains worthwhile if only for the 6th String Quartet, and the Smiths’ is interesting for providing the original version.